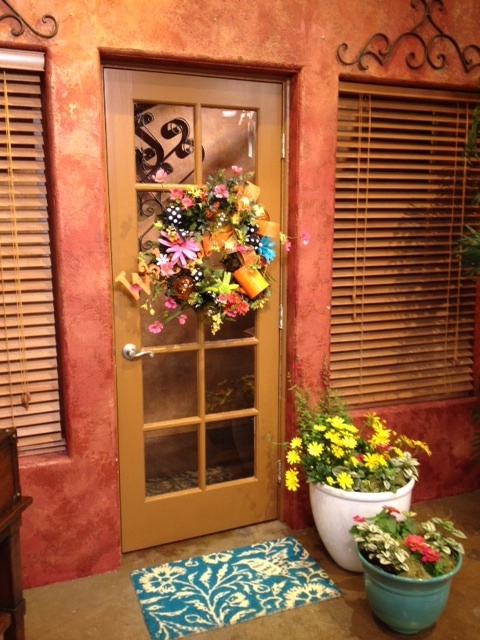 Recently, we had the opportunity to do a segment on @San Antonio Living on creating a Springified front door. 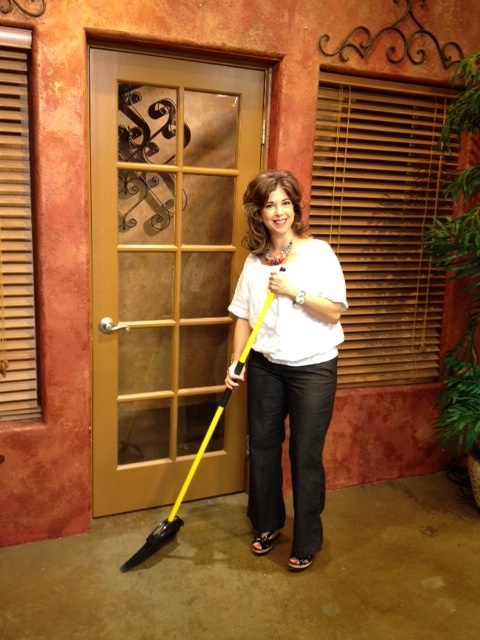 It was a ton of fun and there are several practical tips for you to get ready to Welcome your neighbors! Clean up first! Step back and look at what your friend will see when she’s coming to visit. Are there cobwebs, dead bugs(UGH), leaves? Get rid of them with a little sweeping! 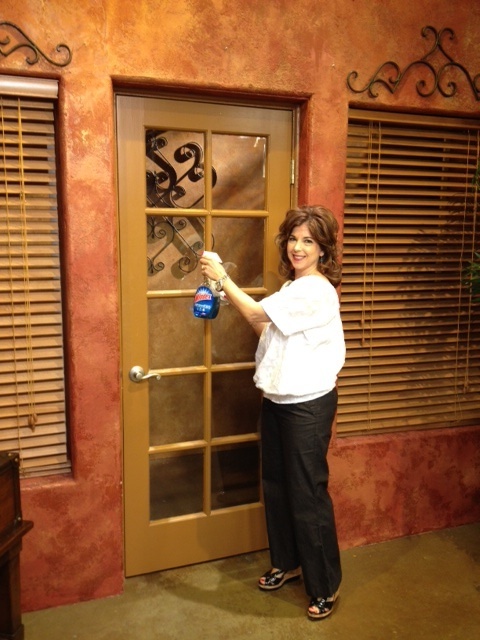 I know, I know window cleaning-yuck! Luckily, it only has to be done a few times a year or in my case maybe once every few years. Sssh, don’t tell! I should do it more because I really do like it when the sun shines in from a little @Windex use! Add, a cute front door mat. It will make you smile every time you open your door. This one is from @World Market and I loved the turquoise color. Have you noticed all of the Turquoise on Pinterest? Do you Pinterest? We do! Follow us at http://pinterest.com/showmedecorate Need an invitation-leave a comment below and we’ll send you one. Add in a Cute Wreath for attention! 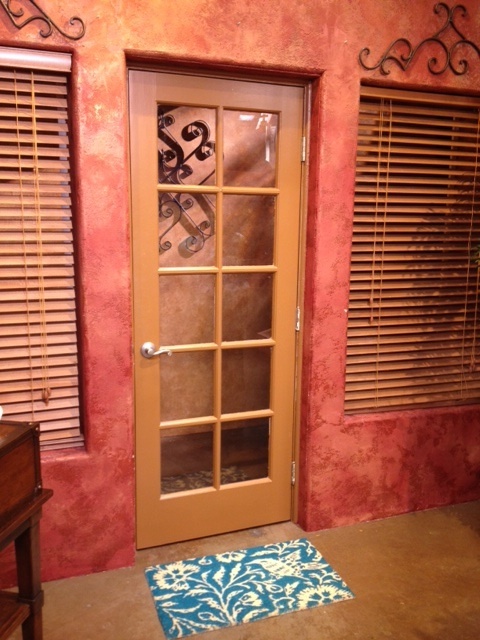 This one was made by our Show Me team in San Antonio. Don’t you love the Tangerine? Oprah says it’s the color of the year. The black and white polka dots really pop. 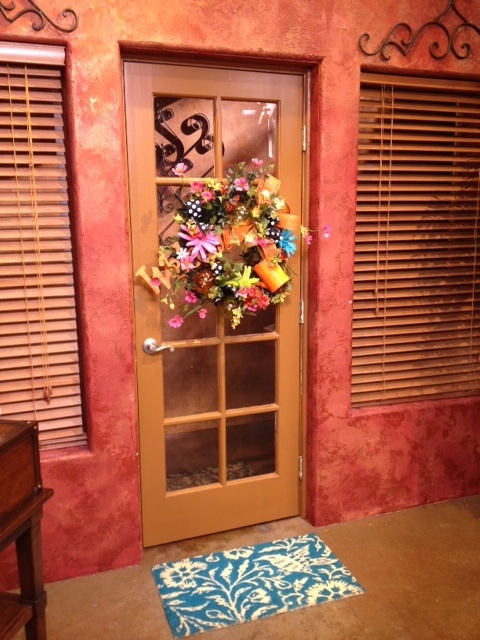 We used great wired ribbon from @Reliant Ribbon and focal points – Welcome Sign and Watering Can from @Hobby Lobby. There are bows and half bows so make sure and go to http://www.bowapp.showmedecorating.com to learn how! Now, we love permanent botanicals for our decorating, but for your pots and flower beds please, please, please, use real flowers and greenery. I love a touch of white because it shows up from the street. These pots are from @Lowes and are so light weight. You don’t need a bruiser to move them.